2 | For more information call 425-430-6700 or visit Rentonwa.gov City Officials Denis Law, Mayor Jay Covington, CAO Kelly Beymer, Community Services Administrator City Council Ed Prince, President Don Persson, President Pro-Tem Ryan McIrvin Armondo Pavone Ruth Pérez Randy Corman Carol Ann Witschi Parks Commission Marlene Winter, Chair Cynthia Burns Al Dieckman Larry Reymann Tim Searing Shun Takano Troy Wigestrand RENTON ACTIVITIES GUIDE SUMMER 2018 Special Events . . . . . . . . . . . . . . . . . . . . 3 Library Family Events . . . . . . . . . . . . . . 8 Free Food and Fun! . . . . . . . . . . . . . . . 9 Youth Summer Day Camps . . . . . . . . 10 Youth Programs . . . . . . . . . . . . . . . . . 12 Youth Sports . . . . . . . . . . . . . . . . . . . . 17 Adult Sports . . . . . . . . . . . . . . . . . . . . 19 Adult Fitness . . . . . . . . . . . . . . . . . . . . 20 Outdoor Recreation . . . . . . . . . . . . . . 22 Special Interest . . . . . . . . . . . . . . . . . 23 Specialized Recreation . . . . . . . . . . . . 24 Renton Senior Activity Center . . . . . . 25 History Museum . . . . . . . . . . . . . . . . . 26 Volunteer Opportunities . . . . . . . . . . 27 Rental Facilities . . . . . . . . . . . . . . . . . 28 Golf . . . . . . . . . . . . . . . . . . . . . . . . . . . 29 Registration Information . . . . . . 30 Neighborhood Program . . . . . . . . . . . 32 Renton River Days . 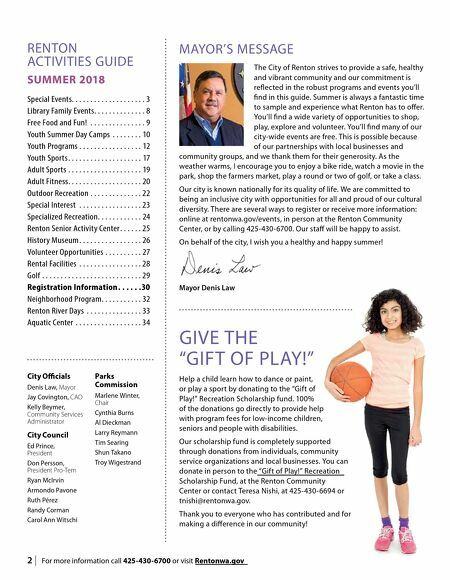 . . . . . . . . . . . . . . 33 Aquatic Center . . . . . . . . . . . . . . . . . . 34 MAYOR'S MESSAGE The City of Renton strives to provide a safe, healthy and vibrant community and our commitment is reflected in the robust programs and events you'll find in this guide. 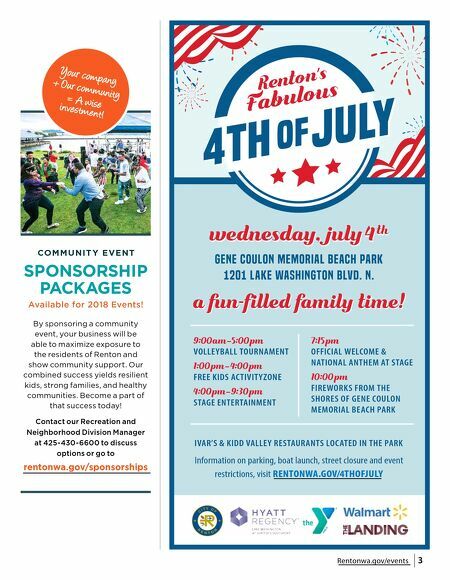 Summer is always a fantastic time to sample and experience what Renton has to offer. You'll find a wide variety of opportunities to shop, play, explore and volunteer. You'll find many of our city-wide events are free. This is possible because of our partnerships with local businesses and community groups, and we thank them for their generosity. As the weather warms, I encourage you to enjoy a bike ride, watch a movie in the park, shop the farmers market, play a round or two of golf, or take a class. Our city is known nationally for its quality of life. We are committed to being an inclusive city with opportunities for all and proud of our cultural diversity. There are several ways to register or receive more information: online at rentonwa.gov/events, in person at the Renton Community Center, or by calling 425-430-6700. Our staff will be happy to assist. On behalf of the city, I wish you a healthy and happy summer! Mayor Denis Law GIVE THE "GIFT OF PLAY!" Help a child learn how to dance or paint, or play a sport by donating to the "Gift of Play!" Recreation Scholarship fund. 100% of the donations go directly to provide help with program fees for low-income children, seniors and people with disabilities. Our scholarship fund is completely supported through donations from individuals, community service organizations and local businesses. You can donate in person to the "Gift of Play!" Recreation Scholarship Fund, at the Renton Community Center or contact Teresa Nishi, at 425-430-6694 or tnishi@rentonwa.gov. Thank you to everyone who has contributed and for making a difference in our community!